Sometimes there’s a man, who’s just the right man for the job – and the only man for an impossible job. Case in point: Rufus Excalibur ffolkes (that’s two small ‘f’s, thank you, played by Roger Moore). He’s a brilliant eccentric and a misogynist. He likes cats, deplores smoking, enjoys needlepoint, and drinks his Scotch at all hours of the day the way it’s damn well meant to be drunk: neat. He’s also an ex-British Navy man, and one of the best marine counter-terrorism experts in the world, the leader of his own crack squad of paramilitary frogmen: ‘ffolkes ffusiliers’. 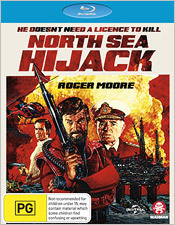 So it only makes sense that, when a team of terrorists led by Lou Kramer (Anthony Perkins) takes control of a deep sea oil platform in the North Sea, threatening to blow it up unless Her Majesty’s government pays a £25 million ransom, Admiral Sir Francis Brindsen (James Mason) turns reluctantly to ffolkes and his men to set things right. North Sea Hijack is a film that’s both ridiculous and terrific at the same time. The last film to be written by Jack Davies (of Those Magnificent Men in Their Flying Machines fame) and based on his own novel, Esther, Ruth and Jennifer, its pulp story is by turns taught, ingenious, and droll. The action is capably directed by Andrew V. McLaglen, a veteran of 60s and 70s TV movies and big screen adventure and western fare, including several John Wayne films (McLintock! among them). North Sea Hijack features some of the best miniature/tank work you’ll ever see. It also offers one of the great non-Bond film performances of Roger Moore’s long career, not to mention a terrifically manic villainous turn by Perkins. One can easily imagine Jeremy Irons having used Lou Kramer as the basis for Simon Gruber in Die Hard with a Vengeance. Madman Entertainment’s Blu-ray offers the film in a find 1080p HD transfer at the original 1.85:1 theatrical aspect ratio. There’s light to moderate film grain visible from scene to scene, most obvious during the title sequences, but the presentation’s color and contrast are absolutely first rate. The color saturation in particular is just gorgeous. And while the image can look a tiny bit muddy from time to time given its age, there’s nearly always abundant detail present. The image is quite pleasing on the whole, and certainly better than you might be expecting. Audio is present in the original English only in an LPCM 2.0 stereo mix of good quality. Dialogue and music are clean and clear at all times. Really, the only knock on the A/V presentation here is that there’s no subtitles or captions for those who might need them. The disc’s extras aren’t much, but they’re better than the letter grade above might imply: You get the original theatrical trailer for the film (SD – 2:12) and the option to watch the film with either the international title (North Sea Hijack) or the U.S. title (ffolkes). And while it’s not really an extra, it’s certainly a bonus: This disc was produced and released in Australian as a Region B release, but it’s actually All Region. So American and international fans of the film can import this disc without worrying whether it will work in their Blu-ray players or not: It certainly should. If you haven’t seen it before, North Sea Hijack is one of the great and oft-overlooked film discoveries of the 1970s. And if you have seen it, you probably already have a fondness for it. It’s not exactly an A-list classic, but it’s certainly a B-grade gem. Thanks to Madman, it’s also now a must-have title on Blu-ray. Unfortunately, you can’t currently find it for sale on Amazon.com, but you can order it directly from Madman Entertainment (via this link) at a modest price.